Home » Blog » Announcements » UMA Takes Home Award from EIC 2014! UMA Takes Home Award from EIC 2014! 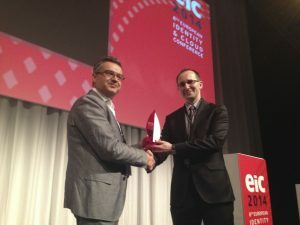 Piscataway, NJ, USA – May 22, 2014 – User-Managed Access (UMA) has won the 2014 Innovation in Information Security award from the European Identity & Cloud Conference. The UMA protocol was originally designed to help individuals control Internet data sharing and UMA’s notion of authorization-as-a-service has generated the attention of modern enterprises to control access to sensitive resources in cloud and mobile environments. Customers, citizens, employees, and partners all demand dynamic access controls in their online experiences. Developed via an open and transparent standards-based approach, UMA’s flexibility toward users and enterprise authorization makes it a key business enabler innovation for the evolution business driving, and privacy respective, identity and access management. UMA has application toward a variety of growing use cases including but not limited to authorization-as-a-service for: Internet of Things, Social, HealthCare, Business Services, University, and Government. ← June 3 Summit: Connecting Businesses – the age of IRM is here!